The 110-230V AC HypaLUME has been designed for applications where high output lighting in extreme environments is required. The lamp produces a net output of 28,000 lumens at a voltage input range of 110-230V AC whilst only consuming 300W. Comprehensive sealing and anti-corrosion measures have been taken to ensure this lamp with stands the toughest conditions. The premium aluminium housing is corrosion resistant with a non-stick and easy to clean surface coating. Heavy duty Grilamid® lens offers unbeatable toughness against impacts and vibration while providing long term UV stability and resistance to commonly used chemicals for the life of the product. 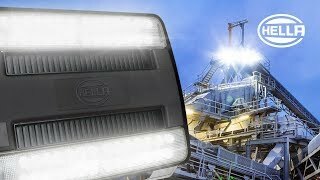 The LEDs have a colour temperature of 5700K to provide a near daylight work environment that is optimal for fatigue avoidance and high alertness. The LED driver electronics ensure light output remains stable over a wide range of voltage variations. The HypaLUME is also protected from over voltage and short circuit faults. The HypaLUME is designed to operate over a temperature range from -40°C to +50°C.